While stopped at the Flying J to deposit our fees for using Diesel Fuel while driving through Idaho we are approached by several Asian people who are part of a tour group traveling to Yellowstone. Apparently they have never scene a house on wheels because they start taking photos (with their cell phones!) and then one of them steps aboard! Always with a smile. And then another one!. I was cleaning the front window and one of them takes the squeegy from me and proceeds to help remove the bugs from the front of the RV. They took so many pictures and I never took one! We tried to converse but all I got was lots of smile, head shakes. I did get from one of them that they were traveling to Yellowstone! 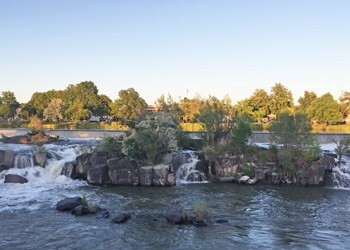 We stopped for the evening in Idaho Falls and took a walk along the Snake River. They have done a really nice job with the riverfront and the river itself. 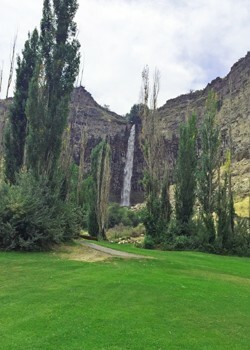 They have created man made falls as part of the hydroelectric power. 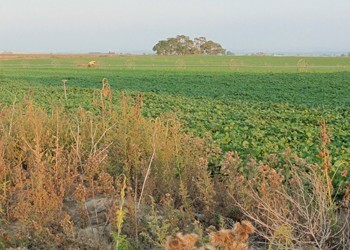 It is beautiful and a very nice walk. 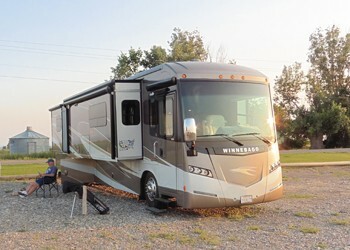 We saw lots of tourists and I think I spotted the same people that toured our RV. Idaho Falls is the last larger city on the way to Yellowstone so it is a good spot to stop, restock before heading into the woods! 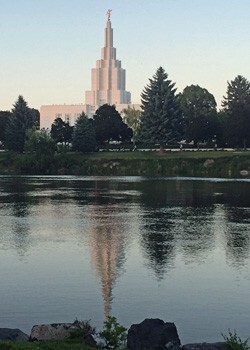 On the eastern bank of the river is LDS compound and this beautiful temple. We only viewed it from across the river. Along the river we did see lots of students taking a stroll along with the many tourists. I guess in Idaho Falls kids walk instead of texting on a Thursday evening. That’s nice. 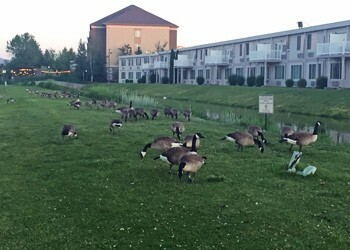 These geese were out for a stroll also. Some of them didn’t like all the tourists coming up and taking photos! 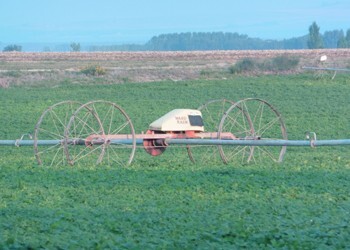 On our travels we see lots of different things than we see at home. This is one. 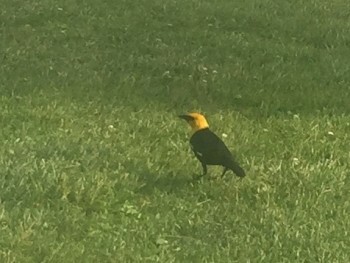 I don’t remember seeing this type of bird. Today we will be heading into Grand Teton and Yellowstone for as many days as we can find a campsite. Photos will be abundant! Yesterday morning while I was playing fetch with Duke in front of the Elks, a very nice man stopped his truck and asked if we were coffee drinkers. Yep, I was just thinking about brewing myself a fresh cup from our Keurig machine. Anyway, I told him yes and he pointed down the road, telling me past the golf course was a great coffee spot. He said the guy ships his coffee all over the USA and has the best coffee around. That got my attention because there were no businesses out here in the country that I could see. So this morning Paul and I got in the car, drove up the road and sure enough right in front of a farm house was a sign ESPRESSO and an American Flag waving. We make the turn and see a little shack and an old truck pulled up to the window. We pulled into the wrong driveway and the man in the booth steps out and says “if you want help you got to get out of my yard and come around to the window the right way!” Great, we’ve ticked off the owner, we probably aren’t getting any coffee. Paul, not being intimidated backs up, pulls around and drives right up to the window where once we started chatting with the guy he was very nice, just a bit gruff, like my husband! Great pair. We had a nice chat, told him we heard he had great coffee and ordered a cup of coffee and a latte for me. Wow, right out in the middle of nowhere I’m getting my Starbucks fix and it was 1/2 the price. We paid $4.00 for both including the cup and tax. Then before we left the guy says to Paul “you got a dog in there?” Oh yeah, usually we roll down the window for Duke to say hi but this time we were so thrown off by our start that we hadn’t. Paul rolls the window down, the guy offers Duke a milkbone and then he says, “can he have a Pupachino?” What? Well of course he can have a treat. The guy proceeds to take a small cup, fill it with whipped cream from a can, sticks 3 large milkbones around the edge and holds it out for Duke. You should have seen our dog, all manners were out the window! He ate as much of the whipped cream as his tongue would reach and then grabbed the milkbones and ate those too. I wonder if I can order a Pupachino next time Duke and I go to Starbucks? Monday Becky picked me and we played 18 holes at Canyon Springs Golf Course where the course is challenging and the landscape is beyond beautiful. 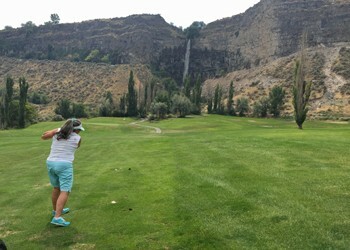 The course is right along the Snake River in the gorge that winds its way thru Twin Falls. 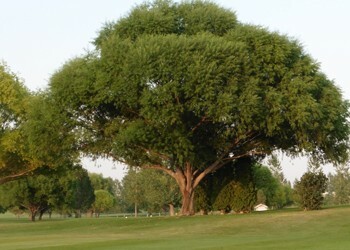 I really enjoyed the afternoon playing and golfed well, one of my better scores for 18 holes. We met with Becky and Lonnie for dinner in town after where I had my first rainbow trout. I don’t remember ever having trout but I will definitely be ordering it again. It was really good. 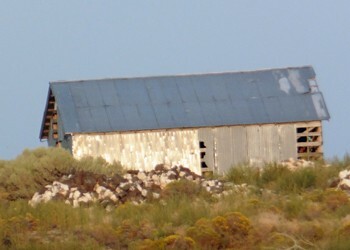 Sunday afternoon we packed everything away, raised the jacks and headed southeast to Twin Falls, Idaho. We are heading towards the Rocky Mountains with a few detours along the way. We arrived at the Snake River Elks lodge and when checking in Paul found our friend Becky who we met at the Albuquerque Balloon Festival. I was planning on meeting Becky on Monday for a round of golf, so finding her here was a bonus. 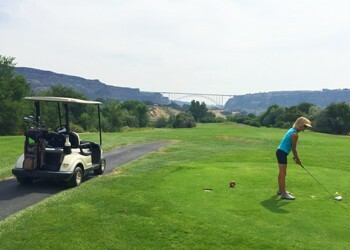 I quickly grabbed my clubs and headed to the course to play 9 holes with her and a friend of hers, Pam. It was a beautiful afternoon and I played ok. 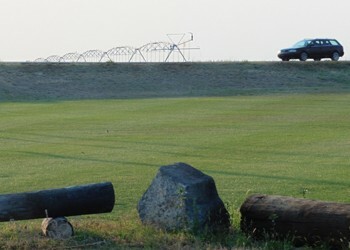 The course is attached to the Elks Lodge but privately owned and very nice wide fareways and lots of very green grass, they must not have a water shortage here. The smoke in the air is also much better as we get further from Washington. Paul got us set up in our site while I golfed. We are the only ones here Sunday evening and it is a very nice setting; there are corn fields all around and of course the golf course. This is a great spot for a couple of days. Passing through Boise Idaho for a few days the Western Idaho Fair is going on, and it is just down the road. I feel another eating binge coming on. We started our afternoon with dessert and after cruising through the vendors building where I am happy to say I resisted the many choices of pots and pans, cheese graters, slice-it, dice-it and jewelry purchases. We made it out of the building with my wallet still intack. However, food alley I was not so lucky. We enjoyed lemonade, frozen lemonade (it was hot! ), corn dog, lamb steak sandwich, a brick of curly fries and a gyro. 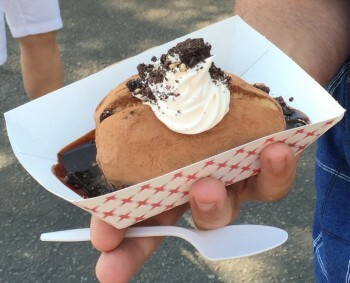 The Idaho Spud dessert, ice cream shaped like a potatoe, rolled in cocoa powder, split down the middle to fill it full of whipped cream, topped with crwas the best item they had! I wanted to go back for a second one. I did it, I really did it! When we first started this learning to eat rather than eating everything, and anything anytime I thought we will lose a few pounds, learn a couple new things about our bodies and probably keep doing what we love, EATING! Somehow that didn’t happen and I find myself today celebrating that I finally after 30 years weigh what I should weigh. I met my goal today! Yippee, congratulations! Lets celebrate! And I did, we had our friends Kathy and Rob, who live near Boise over for dinner and I made a really healthy dinner, Kathy brought wine which I thoroughly enjoyed and I made dessert! I made brownies (from a box, cause I think they are just as good as the scratch ones) and we had a scoop of Cafe Latte frozen Yogurt on top! It was so yummy. I promised that I would give the rest of the pan of brownies away and Paul delivered 2 large brownies to some neighbors in the RV park but the other 1/2 of the pan is sitting on my kitchen counter and I haven’t touched them! That deserves a big pat on the back for me! I can’t eat them. Today we are going to the fair where I will eat lots of fun stuff so the brownies may test me again tomorrow and if I can hold off I may have another before they dry out! Do you know how amazing that statement is? I use to make a pan of brownies, Paul would eat 1 and I could consume the rest in 2 days max!!! So, another milestone has been met. I feel confident that I can do this and I also feel very proud of myself. It’s hard but not impossible so I will keep working at it and enjoying life to the fullest. Have a great day. Do something you love, I am!!! Posted in Idaho, Weighty Posts | Comments Off on I did it, I really did it! It went from 95 to 77 between Thursday and Saturday! Sunday morning we woke up to needing a light jacket. The weather slowed us down a bit but we still managed a short hike near Priest Lake and lunch on the lake. 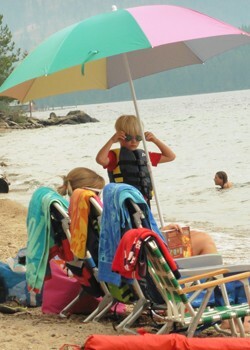 This family of four showed up right after us and set all their stuff up, which was several loads of beach chairs, towels, toys, umbrellas and coolers. Then the mom and oldest boy sat in the chairs and opened their books! Dad organized all their items. See how each chair has a towel? The little guy was running from toy, to blow up toy, rolling in the sand, tromping into the water and no one seemed even a bit interested! I guess that was why they had so many toys!!! The lake is beautiful and when the sun finally came out about 3 pm, lots of boats were on the water. Today we had to say goodbye to northern Idaho and head back south. We are in Spokane for the evening and will be heading towards Boise tomorrow. 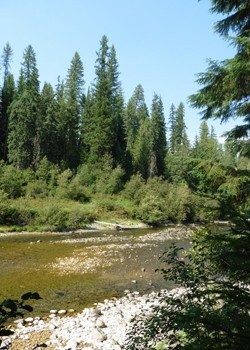 We had a nice walk along the Spokane River this afternoon which is only about 1 mile from the Elks where we are parked. Cotton Candy, Cows, Pigs & baby Goats! Bonner County Fair in Sandpoint had just the right mix of farm smells, tractors and food. We enjoyed huckleberry ice cream, italian sausage, kettle korn, brisket, haystacks and frozen yogurt just in case we hadn’t consumed enough calories! It was all so yummy. The fair is definitely not a tourist stop in this quaint lakeside community. There were no slice’em, dice’em or expensive pots & pans that cook by themselves, just a few local businesses trying to get the word out that they support the community. There was one lady and her troupe trying to convince teens and their parents to put down the cell phone before they get cancer and one candidate running for the local representative spot. 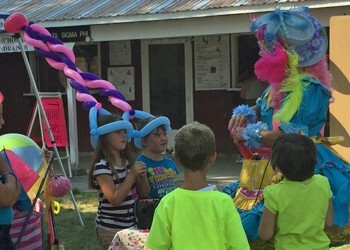 We spent a fair amount of time watching this one lady entertain most of the children at the fair! She needed an assistant! The evening’s highlight was the barrel racing in the big arena! The girls were pretty good. During the practice, warm up we did see one teenage boy on a horse but he didn’t compete! I say smart young man, pick a sport where it is mostly girls with rich parents and him! Great way to get a girlfriend! And I almost forgot, on Tuesday we got or SeaDoo ride. The weather wasn’t the warmest. In fact a huge cloud descended on the lake just as we were heading out! Paul loved it cause he hates the sun. I wanted it hot so I could fall off and go for a swim. We did learn that next time we get 2, one for each of us because one of us likes to just go straight and fast and the other wants to stir up the lake! He did release control for about 15 minutes but wanted to get off! And at the end of the ride, I got to jump in and take a quick swim. It was amazing. The water is crystal clear and not too cold. Posted in Idaho | Comments Off on Cotton Candy, Cows, Pigs & baby Goats! It’s my Birthday! When we are out on the road it is mostly lots of fun but I have to admit that on my birthday I am especially home sick! Paul mostly handles it pretty well unless he misses all the clues! This year was no different, I really love living our life but I have to admit today I wanted to be home with my girls! They both called very early in the morning so that helped and then Paul planned us a very nice afternoon including dinner on the lake where he even picked the restaurant, called them and chose my meal, complete with dessert that they don’t even make there! 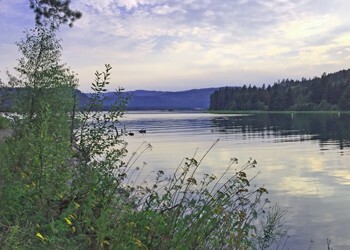 We head to Sandpoint, Idaho where Paul had made a reservation for us to take a SeaDoo ride. I love the water and have great memories of houseboating on the Delta with my family and loving the SeaDoo so this was going to be really great! We arrive there and they have no reservation! Paul had only left a message, cell service is lousy here or they have lousy bookeeping but they said they called and left a message! The bad news was they didn’t have anymore openings, the good news was it’s a cute little town and they were having a craft festival right near the beach! We enjoyed the craft fair and then I took a plunge into the lake with a little sunbathing afterwards! Then it was finally time for dinner! We have been dieting as everyone knows by now so dinner out is a really special treat! The restaurant was right on the beach so we changed and headed over! It’s my birthday so of course I’m having a cocktail! or two!!! Then Paul orders our dinner! That’s different. I don’t think I have ever had someone order my food for me! I didn’t even have to decide between the amazing sounding dishes because he did that for me! He can be so romantic! Dinner was wonderful and now for dessert! I’ve been talking about what I have really been missing and my favorite dessert is a warm brownie topped with really cold vanilla ice cream and a bit of chocolate sauce! Paul had requested this when he made the reservation and they don’t make it but they make a molten chocolate cake but they don’t have ice cream! Between Paul and the hostess they had figured we can get the cake to go, walk to the ice cream shop and get a scoop of ice cream and there you go! That’s what we did!, The girl in the ice cream shop was impressed that there was that much effort put into dessert! And it was PERFECTION!!!! My birthday was almost perfect and I really enjoyed the meal! The bad news is the scale was not friendly the next morning! More about that next post! Moving forward – or East! Remember our bikes got stolen in California while waiting for our RV to be repaired! While we were in Spokane I found a bicycle on Craigslist and we went and bought it! Craigslist can be creepy and this was no different; two guys hanging out infront of a very rundown shack of a house waiting for us to arrive to buy an bike for $80. I took it for a test drive and offered them $50. That was the easiest negotiation I’ve ever done. As we were loading the bike into the car, the two guys walk off down the street! Hmm,, maybe they didn’t even live there? maybe they were stealing it right then! Anyway, I got a bike to ride and it is very nice! We moved today! Another state on our map! This is the first trip to Idaho in the new Motorhome so a sticker gets to go onto the map! 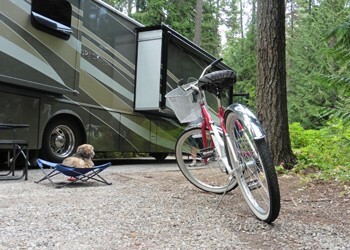 We are at the Riley Creek Campground right on the Pend Orielle River/Lake! They call it a river but it is more like a lake because of the dams. We will be here a week for more fun in the sun! 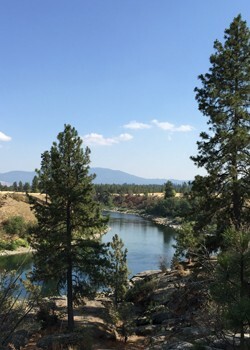 Posted in Idaho | Comments Off on Moving forward – or East!